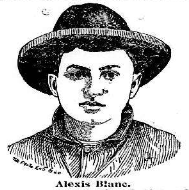 On this date in 1897, some 4,000 residents of Lafayette turned up to watch the hanging of two Parisian-born young men. It had been nearly a full year since Martin Begnaud was discovered bound, gagged, and stabbed over 50 times in his general store at Scott, Louisiana, just outside Lafayette. That was on April 22, 1896. The motive was self-evident: the prosperous late burgher had been plundered of several thousand dollars. But who did it? The matter remained a mystery for many months, although two men were indicted for the deed — and blessedly never brought to trial. 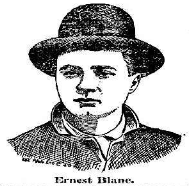 But a few days after the murders, brothers Ernest and Alexis Blanc, teenage French orphans who were sharecropping on a plantation in April 1896 also abruptly disappeared without even bothering to sell their crop shares. This naturally raised suspicion as well, but their whereabouts were totally unknown and as months passed any hope of finding them had practically vanished. Just after New Year’s 1897, the Blancs made a slight miscalculation: they turned up again in Scott and applied to work at their old plantation. They were swiftly arrested and questioned separately. It did not take long for them to crack; indeed, full of guilt as they were, one might speculate whether these young Catholics didn’t return with the subconscious desire to purge themselves. secured the loan of a book treating of the daring deeds of Jesse James. From reading this book originated the idea and our plans for the murder. Seeing how poor we were, and how difficult to otherwise better our situation, we made up our minds to emulate the examples inculcated by the book. The fact that there was a sentencing at all was a bit of an achievement, and the Blancs have generally been considered the first legal hangings in Lafayette Parish. Actual or suspected malefactors were typically handled with more dispatch and fewer legal niceties previously (also making it something of a miracle that the original, wrongly-accused pair was still around to draw breath). Both Ernest and Alexis spent a good deal of their time jailed in New Orleans for their own protection. But that protection ran out today. It was a life of tranquility, sweet and honest, which we regret having discarded to follow the evil promptings of ambition; the love of fortune, and the desire for gold which the devil suggested to us through the leaves of a book entitled the “James Boys.”** It was by reading this book we were lead to steal. Why work in the field? Why walk behind a plow? And at the end of the year receive not enough to buy clothes to put on our backs? To rob one of his gold in a single night appeared to us much easier. The birds had eaten the crops and we were discouraged. In the silence of the night this sonorous voice appeared probably stronger than it really was and impressed us with a feeling impossible to express, and we rushed to his room and I (Ernest) stabbed Martin who was sitting on his bed. How many times I stabbed him I know not, nor did I ever know. The Blancs logged some serious mileage in their months living on the Begnaud score. But Catholic guilt aside, it sounds as if their capture might really be attributed more to the country’s miserable economic situation. After visiting Belgium and England we boarded a steamer for New York City arriving there on the 12th of July. We had already spent the greater portion of the $3,000 [stolen from Begnaud]. Then we commenced our journey across the United States, visiting Chicago, St. Paul, Helena, Portland, Sacramento, San Francisco, Los Angeles, El Paso, Salt Lake City, Ogden, Omaha, Council Bluffs and St. Louis. In the latter city we spent the remainder of our money. Each one having ten dollars, we took the Frisco line on foot, passing through Missouri, Arkansas, Indiana Territory and Texas, and followed the Texas Pacific as far as Mexico, where we rested a few days. All along the route we tried to get work, but failed. There was nothing for strangers to do. It is in this manner that we reached Lafayette on January 2, 1897. Knowing so many people there we thought it would be easy to find employment. We knew that we were risking our necks, but being so miserable, did not care very much. And this decision to risk returning in preference to starvation is, after all, nothing but the same calculation of risk and reward that people at the economic margins have always made: to descend a lethal mine to feed one’s family; to seek one’s fortune on the treacherous seas; or if it should come to that, not to walk behind the plow but to follow the lead of the James boys and make one’s bread by banditry. * According to No Spark of Malice: The Murder of Martin Begnaud, the Gazette cleverly obtained the full rights to all the Blancs’ prison writings, and were able to turn them into a 23-page French pamphlet La Vie, le Crime et les Confessions d’Ernest et Alexis Blanc; ou, L’Histoire d’un Crime Horrible. This sold like hotcakes after the hangings and would now be in the public domain; sadly, it does not appear to be available online as of present writing. ** There were probably several books of this title then, just as there have been several since. This volume has a 1911 copyright, but if it is not a version of the same book the Blancs read, it’s surely not too far distant.